Why Would You Need Both GPS And DME? It all started with on weird note on the ILS Z or LOC Z Rwy 23 at Walterboro, S.C. (KRBW). The note says: “GPS and DME required (emphasis mine). Now GPS lets my phone spit times and distances to four different Starbucks dispensaries within the surrounding eight blocks, complete with verbal directions. Likewise, GPS in the cockpit makes DME an eBay novelty. You can substitute GPS for a DME requirement in virtually every situation—so how can an approach require both? It doesn’t. You can fly this approach with only an approved GPS. Now come down the rabbit hole with me to understand why that’s true. Spoiler alert: This discussion might reveal that you’ve been reading approach charts wrong for years. If GPS can substitute for DME, then why do some charts specifically say that both DME and GPS are required? Good question, and there is an answer. As in most cases with apparent chart ambiguities, it's just not an obvious answer. Replacing a specific runway with a letter in the approach title means that only circling minimums are available. This happens when the final approach course doesn’t align within 30 degrees of a runway, the descent from MDA to the runway would be too steep for a straight-in, or the runway environment lacks required items for straight-in minimums. Required items include things like runway markings and lights. If any of those criteria are true (the VOR/DME-A at KAUG meets the third one), no straight-in minimums are published even if the final approach course aligns with a runway. Only circling minimums are published and the approach is to all approved runways. You can still land straight-in if you want, but that’s for another discussion. The other common reason for multiple versions is different equipment requirements, and that’s what’s happening at KRBW. Start with the Y approach. This is a conventional ILS, with a requirement for DME stated in the notes. The question is: What for? It can’t be for a transition from the enroute environment because those notes appear on the plan view, not in the notes section. The IAF at LAMKE is a fix on V18-311, so you can get there by VOR. VOR capability (or GPS equivalent) is assumed, so it’s never stated as a requirement. An ILS never requires DME for identifying the FAF or DA because the FAF is glideslope intercept and DA is by altitude. Cross-check of glideslope intercept altitude is a good idea, but it’s never required. The missed approach goes to STOAS, but that can be identified as an intersection of two VOR radials. The answer is that DME is only required for the localizer approach. There’s no other way to identify the FAF at DOTMY or the missed approach point at 1.1 DME on the localizer. Note that there’s no timing published for FAF to MAP. If you’re flying the ILS you do not need DME on the aircraft. Yes, that’s correct, if you fly the ILS you may ignore that note. Before you press send on the email telling me notes aren’t optional, understand that this chart displays two separate approaches, co-charted. The ILS approach is a different approach with different obstacle requirements and different procedures than the localizer approach. The reason they share a chart is historical. Do you remember paper charts that we used to tote around in hernia-inducing binders? (If not, Google it on your “phone.”) Almost every ILS had an accompanying localizer approach that shared most of the same information. Co-charting the two approaches kept those binders a few kilos lighter. This truth applies to your approach request. You ask for the ILS or the localizer and get cleared as such, “... cleared ILS Runway Two Three approach ...” not “... cleared ILS or localizer Runway Two Three approach.” If you switch from one to the other part way, say because the glideslope failed, technically you should get a new clearance. No one cares in practice, but that’s another discussion as well. 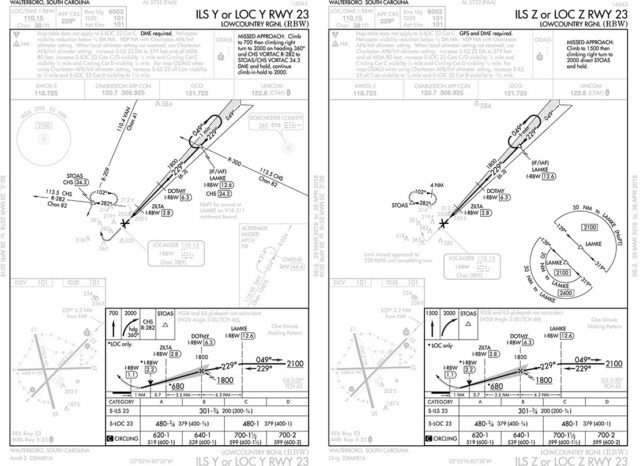 This fact that it’s two approaches is why the correct name is: “ILS Y or LOC Y Rwy 23” rather than what “ILS or LOC Y Rwy 23.”—and, yes, that means the title of the Y and Z approaches at KRUT are wrong (as are many others). This reveals how deep the confusion goes. The charting office even had to straighten themselves out. Expect the incorrect titles to change as charts are updated. Now that we have this nomenclature straightened out, check out the Z approach at KRBW. GPS is used for transition from the enroute environment with no-PT sectors allowing direct LAMKE. That’s a great benefit for GPS-equipped aircraft, but it’s not required because you could arrive at LAMKE via airway, just like the Y approach. The DME requirement in the notes section is for the same reason as the Y chart: it’s only for the localizer version. Per FAA policy, you may substitute GPS. However, the Z approach has a different missed approach procedure in that you go GPS-direct to STOAS rather than intercepting a radial east of STOAS and then proceeding outbound. 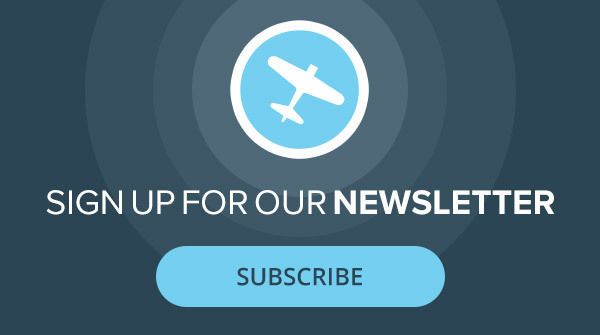 This requires GPS—and applies to both the ILS and the localizer approaches. And that’s essentially what the FAA will be doing in the future. A new area in the briefing strips will specify what’s required for what. I don’t have the details, but I’ll be happy to see it put into effect. Now I hear the cry: “If GPS is required no matter what, and GPS can substitute for DME, why bother saying DME is required at all?” In this case, there’s no good reason other than consistency. However, if the Y and Z had different minimums you could, in theory, ask for a missed approach procedure that didn’t require DME and thereby obviate the need. At least, that’s the way I think about it. I’ve never seen guidance or an FAA position on this, but I can tell you in practice we used to do this all the time where approaches required equipment for a missed we didn’t have installed. We requested alternate missed approach instructions from ATC and got on with business. No one complained or gave us a number to call on landing. I’m not saying that’s an approved procedure, but it does point out how understanding all those notes on the chart is essential to your strategy for flying an instrument approach. There’s an interesting practicality of this having two approaches co-charted when it comes to loading the approaches from a GPS database. Note on the ILS Z or LOC Z Rwy 23 at KRBW that there’s a stepdown inside the FAF at ZILTA. Identifying ZILTA lets you descend from 680 MSL to the minimum of 480 MSL. It used to be you’d only see the ILS approach in the GPS database. That approach might—or might not—contain a stepdown fix like ZILTA. If it didn’t, you’d have to do the math that ZILTA was 1.7 miles from the threshold of Runway 23. It turns out that if you buy your data from Jeppesen, you still do this math. If you buy your North American data from Garmin, however, there are two approaches in the GPS database, one for the ILS without ZILTA in the flight plan, and one for the localizer approach with ZILTA in the flight plan. It’s not a big deal, but it’s worth knowing if you’re loading approaches or choosing your database vendor. Or you could just invest in that vintage DME on eBay to brag that you can fly an airplane—or find a Starbucks—without no stinkin’ GPS.